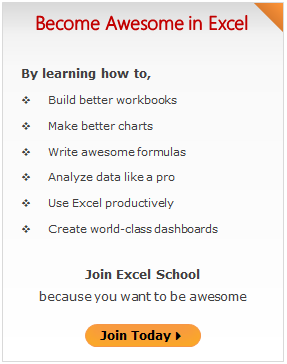 Join Excel School & Become Awesome in Excel Today! 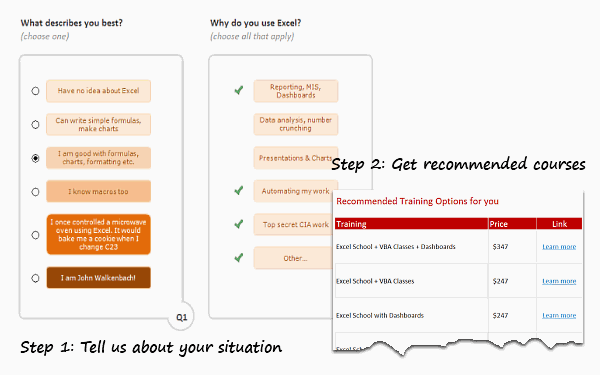 Some of you know that I run an online Excel training program – Excel School. This program has 24 hours of detailed, step-by-step, fun & very useful Excel training, all available online so that you can view & learn at your own pace. Creating this program has been the best thing that happened in my life. 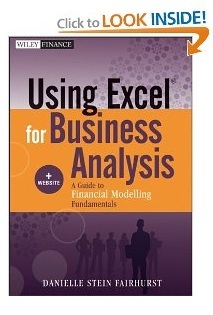 This program has been received very well by Excel users all over the world. Since we launched in Jan 2010, More than 2,500 people have joined Excel School and have become awesome in Excel. Personally, I have learned so much more about Excel, teaching & running business by conducting this program in last 2 years. 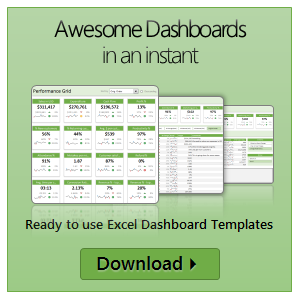 You too can become awesome in Excel by joining us. Please click here. We are so happy to announce Excel for Project Managers program for your consideration. Please read this short page to understand the benefits of this course & to sign-up. Or visit our sales page for details. Well, I am sure you know the answer. This course is aimed at Project Managers, Business Analysts, Project Leads and people aiming for various project management roles. This course also helps project sponsors, people working in reporting & financial analysis of projects. To enjoy this course, you should be familiar with various aspects of Excel (preferably Excel 2007 or 2010). This course is not aimed at absolute newbies of Excel. VBA Classes are Open now. Please join today! 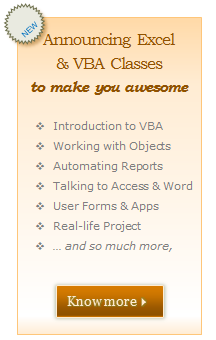 I am very happy to announce that our first batch of VBA Classes is open for your consideration. Please read this short post to understand the benefits of this program and how you can join. Click here to join our class, if you are ready.